The 707 Circuit Breaker Module offers provision for three circuit breakers ideal for medium duty loads, like waste treatment systems and electric toilets. It is designed to separate these loadings from the main DC panel, thus avoiding unnecessary voltage spikes. 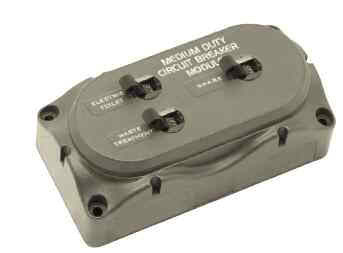 Contained in the Contour lock double module, it is supplied standard with 1 x 50A and 2 x 25A B Series Circuit Breakers. Extra circuit breakers are available.